Of the 22 Grand Masters of the Poor Knights of Christ and the Temple of Solomon, Armand de Périgord ruled from 1232 to 1244 and was associated with many failed battles, one of which resulted in his death at the Battle of La Forbie, or Battle of Harbiyah, near Gaza. Armand de Périgord was born in the year 1178. He was a descendant of the Counts of Périgord and the Grand Master he succeeded, Pedro de Montaigu. He was in charge of the Province of Apulia and Sicily from 1205 to 1232 then was elected as the Templar Grand Master. He planned several attacks against the Muslim forces, but these failed and it diminished the effectiveness of the order and the overall European control of the Holy Land. In one such incident, he lost over 80% of his troops when trying to take the town of Darbsâk (Hatay Province, Turkey) in 1236. The Crusades were not as popular among the European monarchs and soon the various knighthoods started making peace with the Muslim leaders. Armand made treaty with the Sultan of Damascus and the Hospitalliers made treaty with the Sultan of Egypt. Templar-Damascus Treaty would prove to be a poor friendship, one that would cost them dearly. The Kharismians, a people originating from Minor Asia, were pushed out of their homeland by the Mongols. These forces now allied with the Sultan of Egypt conquer Jerusalem. From there the Kharismians head towards Gaza. It was here that the Battle of La Forbie occurred. The Kharismians and Egyptians met an army composed of Templars, Hospitalliers, Damascene troops, and other Christian chivalric orders. The battle started on October 17th, 1244, and lasts for two days. This battle was costly (more than 30,000 died in this battle) and eventually the Damascene troops fled leaving the Christians alone. Around 30 Templars survived and it was here that Armand de Périgord was killed; there are some accounts that state he was captured and died in prison 3-years later having refused to be ransomed. The losses and aftermath of the Battle of La Forbie is seen as devastating as the Battle of Hattin as the Battle of La Forbie marked the collapse of Christian power in the region. While not as famous as Jacques de Molay or Hugh de Payens, the rule of Armand de Périgord is an important lesson on poor leadership which cost the order dearly which would reduce the reputation of the order and add to the fire that would be soon befall the order. 1. Armand de Perigord. n.d. http://www.templiers.org/armandperigord-eng.php. 2. Armand de Périgord. n.d. http://en.wikipedia.org/wiki/Armand_de_Périgord. 3. Armand de Périgord. n.d. http://www.templiers.net/maitres/index.php?page=armand-de-perigord. 4. Battle of La Forbie. n.d. http://en.wikipedia.org/wiki/Battle_of_La_Forbie. 5. Grand Masters of the Knights Templar. n.d. http://en.wikipedia.org/wiki/Grand_Masters_of_the_Knights_Templar. 6. Jones, Chris. Battle of La Forbie (1244 AD). n.d. http://www.fanaticus.org/DBA/battles/laforbie.html. 7. Lotan, Shlomo. The Battle of La Forbie (1244) and its Aftermath. 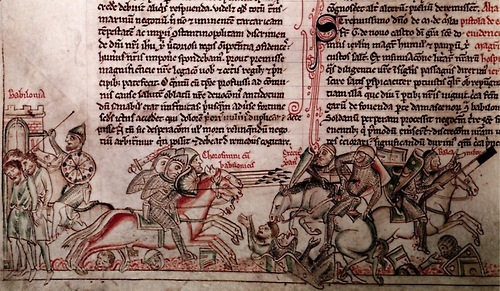 June 6, 2013. http://www.medievalists.net/2013/06/06/the-battle-of-la-forbie-1244-and-its-aftermath/.